Supervisor Peter Candland (R-Gainesville) said the logo should articulate the identity of the county, not just be a symbol. “This logo was meant to mean something,” Candland said. So the board, in addition to issuing a “cease, desist and rescind” directive to county staff, ordered up a work session for July 16, to decide the next step in rebranding the county. County communications director Jason Grant said the logo was developed as part of a process to unify Prince William’s marketing approach. A design firm in Michigan, familiar to Prince William economic development official Brent Heavner who previously worked in Michigan, was enlisted to come up with a design, and agreed to do it for $750, Grant said. Board members wondered Tuesday why a local company couldn’t have been involved. Candland said the mission of the logo was to represent Prince William County to the world. Think you need an icon with your logo? Many business people think that a logo can only be successful if it has an icon, such as the Nike swoosh, the little Tivo guy, the Mercedes modified peace sign, or the NBC peacock. However, the world's best-known and most beloved brands don't use an icon. Check out the small sampling below and you'll see what we mean. A text-only logo done in an interesting and memorable way is a terrific way to brand your business. If you're looking to brand or rebrand your business, contact Julie & Company today at 301-330-9353 or info@julieandcompany.com so we can create an effective logo for you. When it comes to company names, I am adamant: NO acronyms. Why? Because they are impossible to remember and impossible to brand. Maybe I'm more sensitive to this problem because I grew up in the Washington area which is awash in acronyms. Over 140,000 people here work for Federal agencies, - DoD, CIA, FBI, FDA, FEMA, etc. - so many that George Washington University has put together a glossary! These agencies compound the problem by creating more and more acronyms within their organizations. Life is just one big can of alphabet soup. So if you're choosing a corporate or product name, skip the acronym. No one will remember which three letters you've chosen. Ever. Is it MBA or MAB or AMB? Only the business owner knows for sure. This makes ATG - or any other acronym - impossible to brand. Branding is all about uniqueness. If your company name is the same as a gazillion other companies' names, you're not unique - and your company is difficult if not impossible to brand. 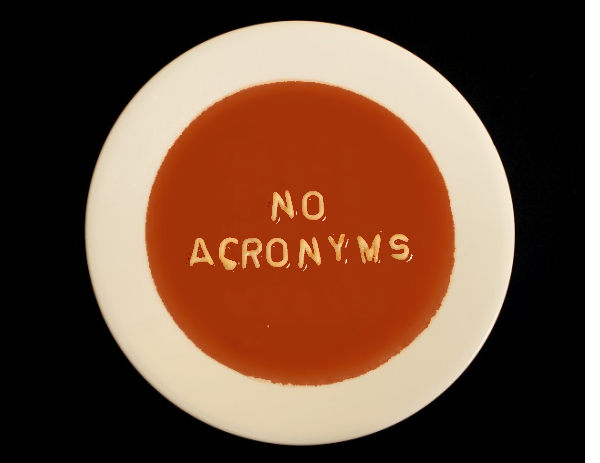 So do the right thing: ax the acronyms!